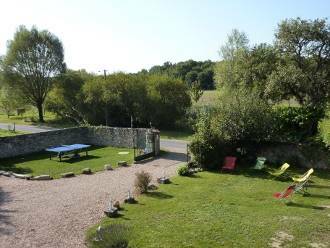 Family suite in B & B in the Loire Valley near the most famous castles. This two level suit, decorated in purple tones has a separate entrance to the garden, it has a lounge on the ground floor with a sofa bed. The upstairs bedroom is very comfortable and spacious, and is composed of a large room with a bed for 2 persons (160 x 200) and two single beds 90 x 190 and a cot for baby. 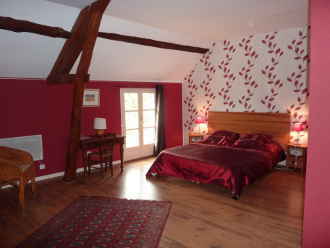 The other room has two single beds 90 x 190. This room can accommodate in a cozy setting, a family of 6 people and a baby. You will find a bathroom with shower and 2 toilets.